The Jewish Community of Sedona and the Verde Valley has a beautiful gift shop located in our main lobby. 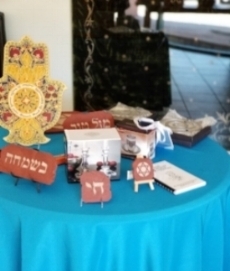 Visitors are welcome to come in and browse through our exceptional, one-of-a-kind items for sale, including plaques made from the local red rock, and unique art work by our Rabbi Alicia Magal. And, we are always adding to our inventory. Hours of operation are Monday through Friday, 10 am to 2 pm. Our address is 100 Meadow Lark Drive, Sedona, AZ 86336. 928-204-1286.